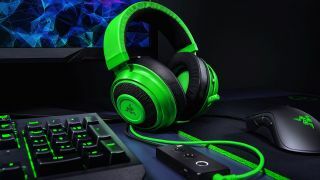 If you're in the market for a new headset to take your gaming to the next level (or at least hear the sea shanties nice and clear in Assassin's Creed Odyssey), then you should consider picking up the Razer Kraken Tournament Edition. It's currently going for £65 at Amazon in the UK, which is a neat saving of 35% off the normal price. The Kraken TE is relatively new, having launched late last year, and it's a slightly superior version of our best PS4 headset / best Xbox One headset, the Razer Kraken Pro V2. What's more, it actually now costs less than the Kraken V2, so you're getting a fantastic bargain here. It's the same price in black or green. It's part of Amazon UK's Spring Sale. This is the cheapest the Kraken TE has ever been, making it a fantastic deal. During our review, we praised the headset's sound quality and comfort, but also admired the economy of design and the extra features added by the TE's external control box. We thought it was the best fit for PC, and actually made it our best PC headset for gaming, but it works equally well with console. The TE was just harder to recommend because it was more pricey than the regular Razer Kraken. With Amazon's current deal, that isn't the case - the TE is a cheaper and better headset. It also tops our list of the top Apex Legends headsets, so if you're a fan of Respawn's battle royale, it's definitely the pair of cans to own.